I'm still in shock that the update has been released now when there were clearly still a huge amount of bugs/issues & user feedback that could have been used from those in the test worlds in order to improve the update prior to it's mass release. I hope you're able to track the amount of clubs that have been quit in the past 24 odd hours as it's pretty unbelievable how many long term users have been forced into quitting a game they really enjoyed and put in some cases years of their time into. I've been defending what feel's like a huge host of issues people have had because at the end of the day they do need to give it time before making such drastic decisions however I am fully behind those whom have stated that "No regard for the long term players" has been made for this update & instead the game has been placed into a position of appearing like such titles as the Football Manager series in order to bring new customers in. It really does feel like those who will chuck money at the game have been targeted and not the long term fans. I was told that ad's wouldn't be as prominent and there wouldn't be more than were shown in the Pavilions Test World and myself personally I don't see them thankfully due to ad block. I'm not going to say to not have them, of course it's a source of revenue and the game needs that stream. The problem is that everyone is complaining that they have to watch a video every time they want to watch Match Highlights or to just look at a Match Report, sorry gents but that is ridiculous, whether you can skip it after 5 seconds or not. I check countless games and match reports when analysing an opponent, if I had to watch a video every time I wouldn't be sticking around. The Manager List is there but you can't see which clubs are unmanaged. You can't offer out clubs that are free but instead you are given the game world number to tell people presumably, backwards step that. You can't share match results!? Seriously? Brilliant for ending the community vibe in game worlds that. It provided discussions and such, it kept the game worlds social, why has it been removed? Sure we can write our own and the social game worlds will but I don't see the need to have removed this. I'm in full agreement that the economy/finances/player wages and such improvements are genuine huge improvements for the game. The issue mentioned in a prior post in relation to the TV Rights and Match Day income changing though is a good point and I haven't yet looked into it but surely they also need updating should they have now been yet. Something I didn't mention on my prior posts but have noticed now is the lack of notifications, if I have new club messages it'd be great to see the drop down icon appear as 'CLUB (6)' for example. I spent hours prior to the forum crashing providing my feedback and constructive criticism on areas for improvement but also discussing good areas of the update. For this update to have been released before it has had both mine and plenty of other people in the communities thoughts, opinions, bugs/issues raised and used/dealt with in order to improve the update is awful. I stopped paying for a Gold Membership myself years ago due to feeling like the game was run in order to make money and not for the community/fans and such and overtime I think some have realised as much themselves and perhaps made similar decisions but now with this update being done in the way it has I have genuinely not seen a single person say they would be renewing their Gold Membership, 95% I would say have said they will be dropping the amount of teams they manage and probably 5%-10% of every game world's population have or have vowed to leave SM all together. I expected a fallout, I predicted as much in my feedback prior but I thought it wouldn't be as many as this and furthermore could be thoroughly prevented by taking more opinions of long serving managers such as myself. It now feels rushed and I know rushed isn't the right term here because a lot of time and effort has been put into it, but clearly asking the fans/community/long serving members of the game for example prior to the updates release was overlooked. It's a longterm plan this update no doubt and in the end it'll probably work out fine but isn't it awful that people that have been here for almost the whole 10 years themselves now feel obliged to give up on SM. On a side note, the SM Forum update is great, it's less 'graphic' like in terms of the main image used. It seems many feel the same needs to be done about SM Worlds now. You can access see the unmanaged clubs within the 'game world' section. I will flag it up with the team re adding it to the manager list on the overview as well. We value all of our community and it simply wouldn't make sense for us to sacrifice them for new users. I simply am unable to play the game the ads on the view match don't load or I get a black box you really should remove the ad from there yes you'll get more clicks but I honestly can't see me sticking around to play the game having to wait on a ad to load to get results for each team adding into that the loading time. The ads are also affecting the chat function I can't see what I have typed out until I hit enter its pretty bad. Wow. Haven't been on the forum in a while. Just felt the need to voice my opinion about the new interface. I've been a member since 2009, with brief breaks here and there. Checking up on my squads everyday was something I really liked, now it feels like a burden. I'm almost getting to a point that I can't be bothered anymore. The GW's I'm in a lot of people have already left there squads. A shame. I'm all for innovating and progressing, IF DONE RIGHT. I'm not a paying member, so I accept the ads. No problem at all. I also understand the need to generate more pageviews, I have no problem with that either. Also changes in the game tactics/finances, no problem. But from going to a 'clean' layout, with a clear structure and a white background to this new layout which feels extremely clustered/stuffed and dark I can't understand. Most buttons look extremely amateurish. Loading time is absolutely awful. I know it takes time to get used to new features, but there are no real new features. Everything is just hidden under different layers to generate clicks. If it was done logically, I could live with it but this is terrible. Especially since it takes AGES to LOAD. I absolutely love SM and it's concept. And I know no one cares but I'm giving it 2 more weeks and if nothing changes I'm done. I'm not talking about 'simple' bugs like players missing, that is to be excepted with drastic changes. My problem is with the layout mostly. We have acknowledged that there are 'loading speed' issues which as we speak are being addressed so we can improve this for you guys. In terms of the background everyone has he option of selecting a lighter or darker background based on their preferences. This can be done by clicking on 'account settings' in the top right corner. Is there still an option to search for a potential new club by name? I logged on a couple of days ago and was like what has happened. So confusing, couldn't find anything, none of my transfers were working and i the time it took for them to start working again I lost 5 players in a bidding war. Please make an option to revert to the old layout, which was much better and more simplistic, the colour scheme was lighter and everything was easier to see. Now I cant log in for 5 minutes to check on my team, I have to wait 1/2 an hour for stupid loading screens. Bring back the old SM. Not hugely fond of the the new UI, feels very child like and seems to be aimed at a very young audience. Not keen on having to find everything I used to have easy access to either. I don't understand why the news feed is on the first page yet to see any new messages that relate to me I have to go to the club section and view the Inbox, it was much better when it was all in one. The breaking news feed bar is also very annoying and tells me nothing that the news feed doesn't. The tactics page is huge and very awkward to use now, having to keep scrolling to try and change players around and team tactics. Match engine is good and a very welcome and long awaited update, as is the finances and stadium building. I am not so sure that the player concerns being sped up will help with player hogging, more like make it very difficult to have a good first eleven and decent subs bench. However only time will tell I guess and maybe the new finance structure will out weigh the player concern bit anyway. I would have liked the ratings system to have been improved and Soccerwiki done away with, it hasn't worked since it was implemented. The same for the SMFA, I see from the first post that something has been "revamped" with it but no real details on what. As a general overview it seems that more time and effort has been made to dress up the game with a new UI without actually thinking about the more important issues. A new match engine (been introduced and bravo for doing so), ratings system and SMFA/Cheat report system were to me and many other community users the main issues with the game. Also, can someone tell me why the deactivate account doesn't seem to work? I tried it but after confirming everything and clicking on deactivate account I just get the SM loading symbol and it doesn't deactivate my account. I'm not looking to deactivate my account straight away now after reading this thread, I am willing to give the new game a chance and to see if any of the changes do take affect. However if nothing improves I would like to know how to close my account down. Whilst I would really like to believe this statement Kev, the years that this forum community have been left unanswered or ignored makes me feel very skeptical. Guys to let you know, I have been managing the same teams for over 7 years now, like a lot of you, and have built up squad after squad over the years by playing the game properly. These updates are mostly in the right direction but the UI is going to be the downfall of the game, the old UI was simple, user friendly and efficient in time management. i think we all liked the home page with the table on it and the messages and news feed, now to see all of those its 5,6,7 clicks away when they were all there properly laid out, everything else was 1 or 2 clicks away now its multiple clicks to see it, its anything but slick or quick when you take the fact most of us log on for 5 to 10 minutes at a time and this UI is particularly horrible to look at, i know the designers probably look up on it as a work of art but its more like a fart as can be seen in the communities reaction to it. Remember without the community the game is nothing all we asked for was a better match engine and maybe a tweak to the UI and finance system instead we got a tweak to the engine and a massive overhaul to the UI. I'm quoting this post Kev. Our gameworld had an issue where apparently it was set to Poor Economy rather than our Gameworld standard Normal Economy. So the figures that I have in front of me may reflect the Poor Economy rather than Normal, but once I've confirmed the Normal economy multipliers (i.e. ticket price per fan etc) i'll get back to you on this post. The changes will be introduced to every Game World when the game is relaunched. We are also going to recalibrate each Game World to reflect the new wages. This will basically increase all club's revenue in line with the new wages. Smaller clubs will be the main beneficiaries because of the equal distribution of TV revenue. Also throw into the equation the revised stadium building and attendances as highlighted in this post and your club will more than likely be better off then they are now. I'd like to point you to the part in red. Our understanding of Stevens post was that all clubs no matter what Division they were in would share the same amount of TV money. I.E. Shrewsbury Town in Division 4 would have the same TV money as Manchester United in Division 1. Was this changed or did we misunderstand his post? I'm actually very disappointed in the new match engine in terms of text commentary , after all these years waiting I was expecting hundreds of new lines of commentary. I'm ok with any changes ingame. But the INTERFACE IS REALLY BAD. Please oh please if you want to keep it, add an option for those who want to keep the old one. I play this game about 5-6 years, and i login almost every day. For the first time i don't want to log, or immediately logout. This is not user friendly at all. It's complicated, wants more clicks, and many page loads, and it's very "shiny". If i want a headache or a game like that, i already play Football Manager. This won't take its place. It's for playing for fun with other users. So take care the users. Give at least the option to get the old interface if you want to keep this one, since you worked for it. But please give us back the old one for those who want it. I repeat, i play this game 6 years, but it's the first time i won't bother play any more since it is so so bad that i don't want even to be here. PLEASE an OPTION for the OLD INTERFACE. I cannot express more how much this is vital if you want us to keep playing the game. The forum layout is even worse than the previous one. I actually like the new game layout, but it's far too impractical (too many clicks needed, you can't click on anything after you set / remove substitutions; it took me an eternity to set my tactics), etc. The player position thing is a joke. Today's players are more versatile than ever irl and that's why many managers are always making positional adaptations with very good results (Sergi Roberto in Barça, for instance). The fact that players can be used in a lot less positions is an outrage. One of the things, that usually gives me the upper hand above other managers, is squad rotation. I usually have like 17 good players tops, but the fact that the formations could accommodate players quite well, position wise, made my rotation easier and more effective. I know there's lots of formations, but in like 20 clubs, I was only capable of fielding my best XI in 1 or 2 GWs. This completely ruins my counter-formations. Now I have to use a formation that simply allows me to filed the highest rated players possible, rather than a suitable counter-formation. And tonight's match results proved this, as they were pretty average. At least you should have given the users a heads up. Had I been notified about this stuff in time, I would have bet a lot more on squad depth. Firstly, when I wanted to adjust the transfer list price to the new value, it doesn't tell you the EXACT amount on the player profile. For example for one player it says "£31.9M", but when I tried to adjust to that amount, it says "chairman won't accept any less than £31,944,000". Well, it doesn't tell me that exact amount on the player profile as it used to. It's only by forcing that error message that I was able to accurately adjust all my transfer listed players to the new values. This took a looooooong time. Another bug with this, when I adjust a player's transfer list price, the green popup confirmation bar shows the previous player's price! Can we have the old 'clear selection' option back on tactics page? It would come in handy for managers who are looking to try out new formations or simply for those who rotates their squad heavily. What did i wake up to? You said you can't set players to unavailable but players in my gameworld that previously were set as unavailable are just that same with minimum price so you cant bid. I keep logging back in to my game worlds, but my frustration is getting worse and my patience is gone! I'm tired. What used to be a few 15 minute breaks throughout the day to check in on my messages and transfers, has resulted in double and triple the amount of time I used to spend because of the numerous clicks and wait times to view and manage what I did on the old interface. My shortlist can't be arranged by age or value. The transfer ban date is no longer visible so i have to click on the player to open his profile to find this. The overview page is useless and most of which is there serves no purpose. Can't you put the inbox on the overview page? The calendar in the top right was much better on the old interface. The breaking news is useless and annoying. The colours are an eyesore. The constant ads I need to watch every time I want to view a match is annoying. I understand the need for revenues, but why am i paying my annual fees plus additional fees for extra game slots and still have to suffer with these ads. The tactics page is a complete joke! I don't even want to write about it. This interface reminds me more of your typical teenager video game. Not sure what demographic is being targeted with this new interface, but it is definitely not for me. I already invest a whole lot of time each day on SM Worlds which I have loved and enjoyed, but this new interface would require double and triple that investment of time which I cannot afford! Sorry, but I am encouraging you to provide us with the option to go back to the old interface otherwise I'll have no choice but to quit this game. I agree with the match engine and player valuation changes, but please go back to the old interface! PLEASE! Pleeeeeeeeeeeeeeeeease bring back the old game. I have been playing this game since 2010 and it was by far the best manager game i have ever played. Navigation is terrible, nothing seems to work the way it should. Lots of problems with too many to list. I am unable to even do basic things such as - look at players that I have sent to the youth/senior team as the page wont load and I just get an error message. I was addicted to this game and last night I did something I NEVER thought I would - I just gave up. I have 10 teams, so much to sort out - One of my teams (Wrexham) I started in the 5th division and I won that league. I got promoted and the following season I won the 4th division. The season after that I finished 2nd in the 3rd division and I am currently top of the 2nd division. Last night I got so annoyed that even though I HAVE PAID MONEY to play this FREE game, I GAVE UP. what bothers me most about the layout is how poorly optimised it is, especially on mobile. the images for the different menu options (squad, tactics, etc.) don't even fill their spaces on mobile! the formations look terrible too with the background images being all misaligned. also, simple things are missing. like getting to squad reports from the squad screen. or seeing a list of all the previous winners of a competition from the competition page. now to do those things requires extra navigation (in fact I don't think there's any page that lists all previous competition winners anymore). on PC it's difficult to use. on Mobile it's difficult to use AND it's not even designed right. What an appalling effort to improve the game. Match engine and other technical parts might well turn out to be an improvement but the irritation of playing the game makes them a waste of time. Takes me a lot longer to do what i used to do, watching the match is painfully slow now and everytime i change pages, it takes 5/6 seconds to load the new page and i now find i can't see everything i used to on the page, forever scrolling up and down where i never used to. I now no longer have the time to look after all my clubs so i will have to cut down and if others do the same, it will mean the end of a lot of gameworlds that were doing very well. Stephen, in your next meeting, please tell everyone how SM have made a mess of the new improvements. Perhaps looking at it from our point of view could be a unique starting point for the company. Congratulation for your fabulous 10th years celebration. I believe that you make these improvement into your game with positive thoughts & goals, but why you make "SM World" look very similar like "SM 2016"? 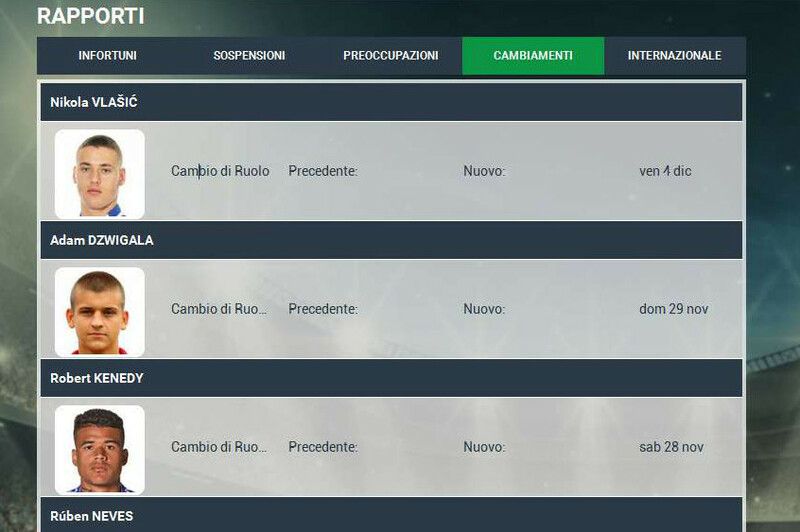 "SM World" is a relaxing football manager game with simplicity, reliable & light interface. That's why many user want to play this game, without overthinking of managing financial, or player concern to much, like Football Manager or Championship Manager game. We could play this game while at office either, like changing our squad for next match, etc. If you want to follow and to compete with other football manager game, it's the right step to build & to improve your "SM 2016". I think the best step is developing your "SM 2016" game with offline & online mode, and NOT bringing complexity of "SM 2016" to "SM World". If you want "SM 2016" app very useful, and want many users playing the game, then create some game world for a season in "SM 2016", and top 3 winners get some prizes like Gold coins or anything that could be useful & give some advantages in "SM World". If you still trying to push us using this new version, I believe many users would prefer to stop playing the game, or maybe to choose other game like Sport Interactive's Football Manager online, that have similar complexity but giving more consistency or stabililty in performance. You should think about forcing us to use new interface, because what we need the most is light interface that brought simplicity when playing the game, just like a testimony in your blog (http://goo.gl/2JDztk). He mention about "The Layout – I like the easy layout. It’s simple and fast". He lives in Suriname, a small country, which it could be very difficult to find internet access in that area, especially the high speed one (it could be also very expensive). You should also consider user's age range. They were some students, some workers, and some unemployment. For workers will be choose simply "SM World", rather than complex interface like your new version. Besides, workers will have more chance to be gold member and will give you incomes, than other users who usually comparing with other famous football manager game. So please consider to give an option at least ONLY for the "Desktop Interface", because that really big matter & major problem in this case. I think that is a good solution for all of us, whether for you as developer and for ours as user. And for Mr. Steven, simple interface means easy to use, to manage & very reliable for every users. That is the meaning of simple interface (UI). If many users complaining about that, it means you failed. I always offering to all my clients this value, because users don't need complicated apps/programs. Their time were precious, and I don't want their wasting it because of my own ego. Remember, they need to adapt. But adaptation for more simple interface, and not for more complex one. 1. Tactical and player's position. a). Player search, so it wasn't need a lot of next button that often error. The most important can be sort by club, price, ranking, etc.
. Team Fixtures & Results. It should be simple to see, just like old version one. It doesn't need any tab, why you split this into 3 sections/tabs? Confusing & wasting in loading time. 3. The way in changing players in tactical formation. We know our player position, so we don't need recommendation that not sort by position number that we already arrange. Old version were better too for this section. 4. Players link to Soccer Wiki for player's information. If you delete the link, then you should provide us with simply & similar informations like in that website. 5. In player search section, value range doesn't work. If I limiting maximum value to $25M, it's show players with value above that. 6. Fixing all bugs that make us always to reload or to click for 15 times until giving the right display or respond. If I analyze, this matter also caused by your new interface. 1. Making our tactic instruction more hidden/private in match statistic tab. Giving basic formation (without movement) is more than enough. This will give flexibility in creating our personal strategy. 2. 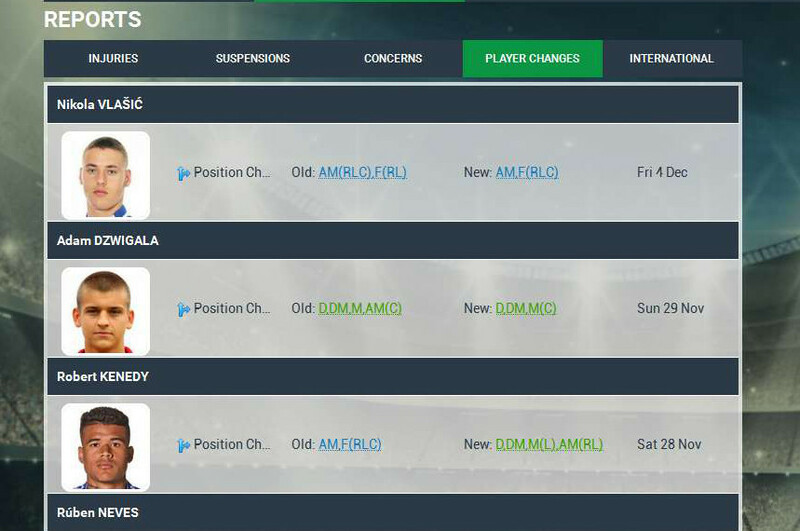 Please add Multiple Action function in Squad Tab, to set Transfer Status, New Contract & Squad Status in easier way. We won't wasting time when loading each player pages for same action. 3. For transfer banned players, it more easy to known if you could make a flag or make their names into different colors. 4. If you double player's value & wage, then it will be fair if you also double our financial too. Example : Before update, if my team have money around $30M, then we could buy Jordi Alba for around $16M and other some players. After update, team money still $30M, then Alba's value change to $26M. So we couldn't afford to buy other players that we've planned to buy. I'm hoping that you have policies for this matters. Thank you. We will eventually get used to it...like we did with the other udates, but there are 2-3 major problems in my opinions. 1. Cannot see my entire first team in Squad. I have all the players when I set the tactis but I enter the Squad and select first team I cannot see them all. 2. There is a big problem with player values, especially for small teams. You just killed everyone playing in the lower leagues [ex.5'th division Englisch Ch.] You invest a lot of time and calculation in putting together a squad and now even if you sell all the players you won't get the investment you made for 3 of them.
. For example, before the upgrade I was doing this when going on the transfer market...a tab for the squad, one for shortlist, one for the player search...Now it takes forever to open all this pages. Hope this feeback helps and you will look into it. Where is the search options? I can't search for new clubs, cant' arrange search for new players according to their rating or clubs. And the club history section is still not complete. It still shows that I have been runner up 2 times in league cup which is wrong.